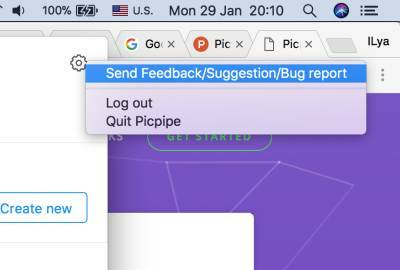 Picpipe is finally getting the stage when it's ready to be shared with the world! In this release, I focused on the features that minimize the time for bloggers and web developers to get images from their computer to the webpage. 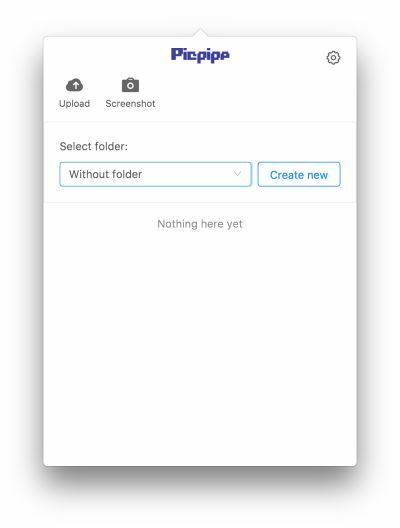 It's very convenient to use this Without folder folder to upload unsorted temporary screenshot and images for instant sharing. Just click on Create new button and write a descriptive title for your new entity. Hit enter once you finished. Lets upload our first screenshot. You can do it by clicking on Screenshot button or with cmd+Shift+4 shortcut. Add Alt attribute value or a quick note to yourself. 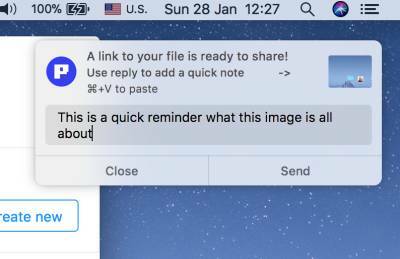 Once your image is uploaded, Picpipe will put the link to your clipboard. Use cmd+V to paste it anywhere. You will also see a notification on the right side. Click Reply to see the message box. You can use this box to add a quick note to yourself, so you will remember what you thought when created added this image. Picpipe will use this text by default for Alt attributes in HTML and Markdown snippets. Change the filename for your images. The number one rule of images optimization for SEO is Name Your Images Descriptively and in Plain English. Picpipe rename automatically rename your images to fit your blog post title (folder name). However, you can give it a more suitable name. Double-click on the filename to rename it. Caution - If you published your images somewhere, make sure to change the link if you rename the image name in Picpipe. This section currently has only two actions: Delete and Export. 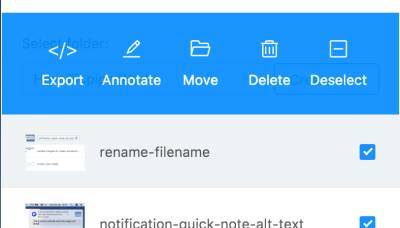 We are planning to add Annotation and Move to another folder in future releases. Click the checkbox on the right of any image to see available actions. You can select many images from X to Y by holding the Shift key. 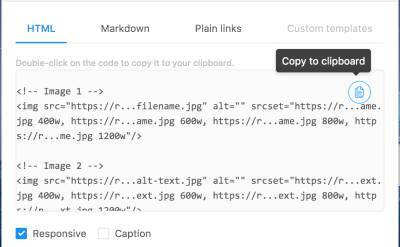 Export images in HTML, Markdown or plain links. Click on Export to open an export dialog. All images that appear in a list view are automatically uploaded to the cloud and have a public link. Picpipe allows you to get this links in HTML and Markdown. More advanced options are available as well. For example, you can get a snippet with responsive images. Simply click on the Responsive checkbox, and you will get five resized images that fit any screen resolution and width. Setup default image optimization parameters. 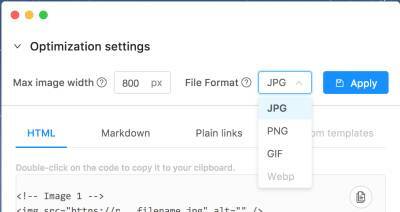 File extension - Picpipe allows you to choose between different image file types: JPG, PNG, WEBP, GIF. Max image width - No matter what is the image source, Picpipe automatically resizes it to fit your page width or image container. This operation is 100%, and there is no danger to resize the image twice and lose the source image. Not even close to the end! We listen to our customer's suggestions and never stop improving the app. Our key metric is your productivity! 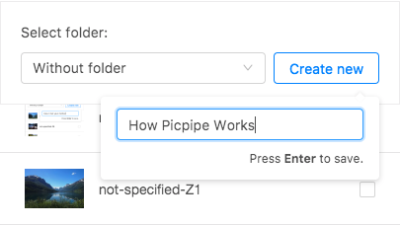 If you don't feel like Picpipe optimize your workflow 100% percent and you still find yourself dealing with annoying tweaks from time to time. Send us your suggestions. It's always more things to improve. We are hungry to hear your opinion and have made it super easy to reach out to us from inside the app! You message arrive straight to our email.